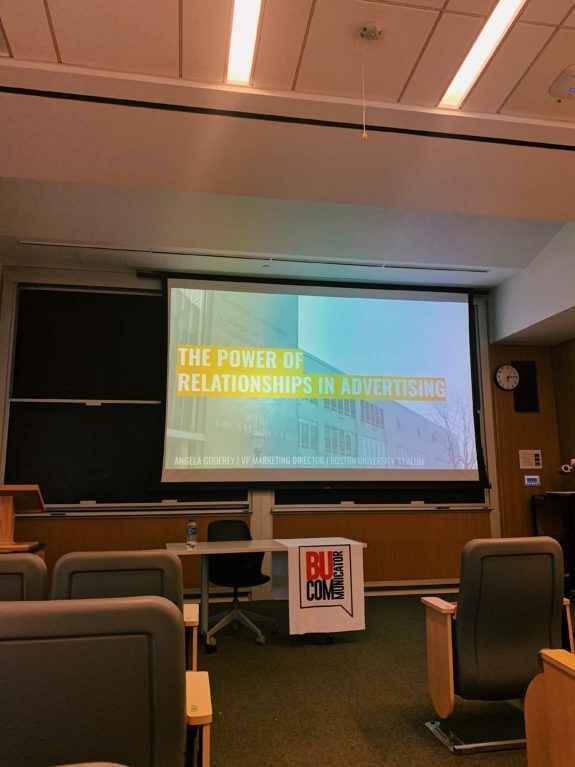 On the evening of March 26, BU alumna Angela Godfrey returned to COM to give a presentation to current students on “The Power of Relationships in Advertising.” Godfrey graduated from BU in 2011 and is now the VP Marketing Director at Arnold Worldwide. 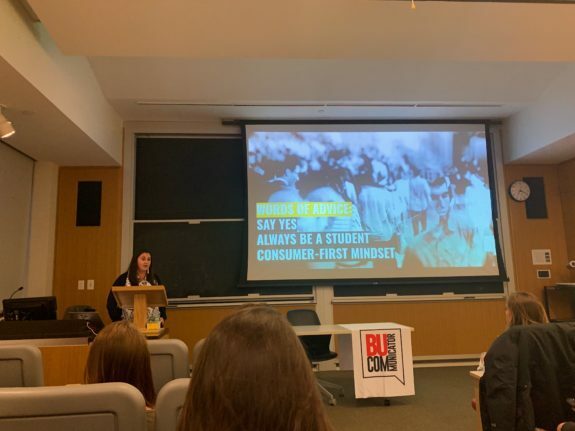 After beginning her career at Arnold, Godfrey changed agencies to work as an account supervisor at Jack Morton, which bills itself as a “brand experience agency,” before ultimately returning to Arnold as their VP Marketing Director. Godfrey’s career path, from Arnold Worldwide, to Jack Morton, and back to Arnold again. “Ultimately, it was my relationships at Arnold that brought me back. Throughout my journey, these relationships helped open up doors for me,” said Godfrey. 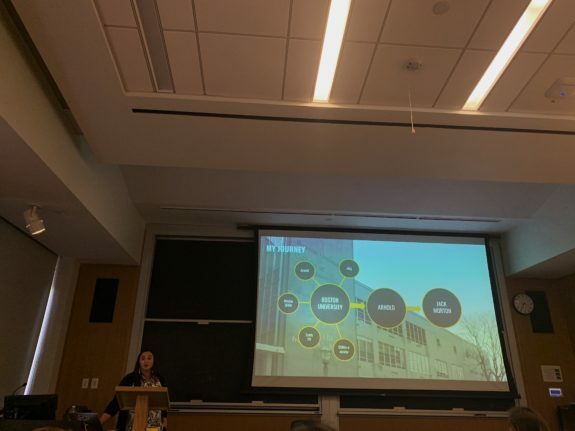 The core of Godfrey’s presentation was then broken up into an analysis of four different groups of people every COM student will come across: classmates, colleagues, clients, and consumers. 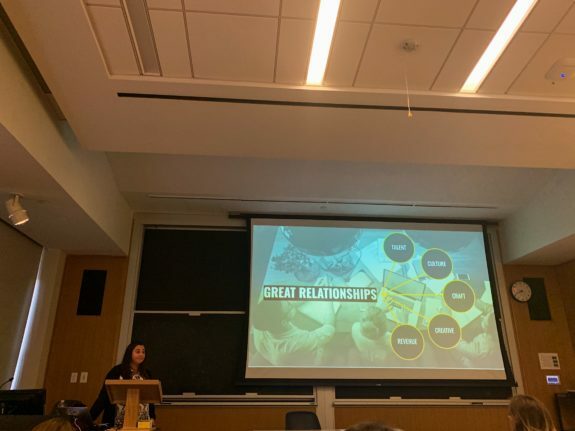 Godfrey went on to illustrate that regardless of which department or level you’re at, everyone should harness the power of relationships in their career. Five types of great relationships. Coffee – “When challenges arise and workplaces get hectic, I have found very few things cannot be solved over a cup of coffee,” said Godfrey. Godfrey left the students with a few more short but sweet points when working with clients: to understand their ambition, to always be honest and transparent with them, and to bring to them solutions, not problems. Words of advice: Say “yes” to everything. Maya Taylor is currently a junior in the College of Communication studying mass communication. 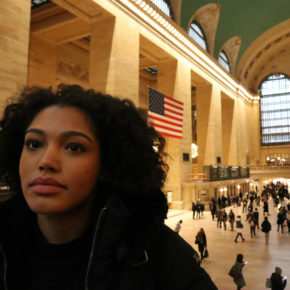 She was born and raised in Pennsylvania, but hopes to move to NYC after graduation to pursue her love of fashion.